Donald Trump has finally rolled out his proposal for how to spend our tax dollars. The short version? Lots more money for the military, lots of tax cuts for the wealthiest Americans, and less for pretty much everything else. This week in OtherWords, my colleagues Josh Hoxie and Miriam Pemberton take a closer look at those numbers. Miriam doubts that we can make ourselves safer by throwing more money at the already bloated Pentagon, even as we’re cutting programs that protect our drinking water, financial system, and workers. And Josh runs the numbers to discover that the proposal won’t balance the budget one bit — but it’ll move a lot of money up to the richest Americans. The other big news this week? The GOP finally rolled out its long-awaited replacement plan for Obamacare, which would appear to cover far fewer Americans. That, in part, is why so many turned out to protest at town halls. Jazz Glastra took a different approach: She met with her GOP member of Congress privately to talk health care, away from noisy crowds. But she still got the brush off, as she explains this week. Rounding out our package, Jill Richardson says you should subscribe to your local paper whether the White House likes it or not. 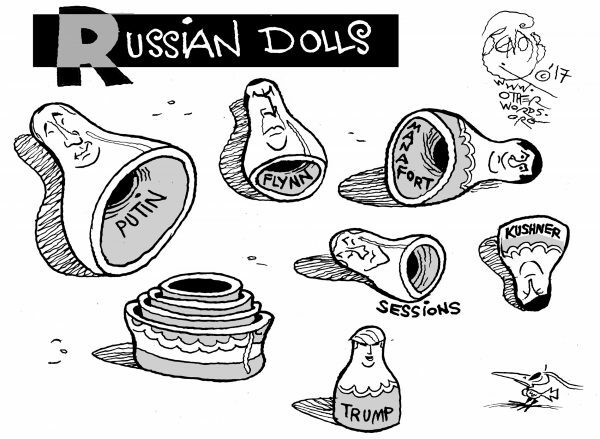 Jim Hightower marvels at Trump’s recent discovery that health care is “complicated.” And Khalil Bendib mocks up the drip-drop revelations of the Trump team’s dealings with Russia. Throwing money at the Pentagon while gutting other programs that protect Americans shouldn’t make anyone feel safer. My member of Congress said he’d rather talk about health care privately. I took him up on it — and was disappointed. The president’s budget won’t balance federal spending one bit — but it’ll move a lot of money up to the rich. If you want to make journalism better, subscribe to your local paper. Trump promised to magically repeal and replace Obamacare. Now he’s learning that magicians do tricks, not magic.